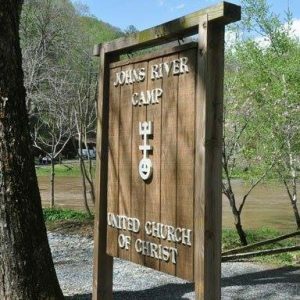 JRVC is an outdoor ministry site near Blowing Rock, NC, owned and operated by the Southern Conference of the United Church of Christ. JRVC is accredited by the American Camp Association. JRVC has two camp environments: the mainsite, with cabins and a dining hall; and the outpost site, where campers share in preparation of meals, learn outdoor living skills appropriate for their age level, lodge in A-frame cabins, and engage in adventure activities. JRVC trips onto National Forest System Lands are authorized under Special Use Permit by the Pisgah National Forest. June 19-25 Senior High Outpost Adventure for youth entering grades 9-12 $475 Campers are challenged by high-adventure activities including white water rafting on the Nolochucky River in Tennessee, and an off site rock climbing experience in Pisgah National Forest. June 26-July 2 Pioneers camp for youth entering grades 4-6 $410 Campers enjoy traditional camp activities (crafts, hikes, archery, stories, games, vespers, campfires). June 26-July 2 Ultra/biking camp for Middle High youth entering grades 7-9 $430 Youth build community through active play. Bike downhill section of Virginia Creeper Trail in Damascus, Virginia; Bikes and helmets provided for all campers on “Creeper Trail” trip. (Campers who can bring own bike/helmet will have option of electing additional afternoon bike trips. The bicycling component of this camp is geared toward beginner/novice level experience and includes rides along Greenway in Morganton and historic tour of early 20th century sites in Mortimar/Edgemont area. June 26-July 2 Senior High Discovery camp for youth entering grades 9-12 $430 Campers discover ways to open themselves to the presence of God in creation and community. Think deep, play hard, brush easy strokes of creativity amidst an environment of discovery opportunities. Join with Middle High Ultra campers on Virginia Creeper Trail bike trips. July 3-9 Classic camp for youth entering grades 4-6 $410 Campers enjoy traditional camp activities (crafts, hikes, archery, stories, games, vespers, campfires). July 3-9 Middle High Outpost Caving camp for youth entering grades 7-9 $430 Campers live in A-frame cabins removed from mainsite area. Camp features canoe trip and caving experience. July 10-16 Youth Work Camp for youth entering grades 7-12 $430 Address shelter/food/environmental issues in foothills of Appalachian Mountains. Combine a mission trip, shared experiences with other youth, along with fun and dynamic learning. July 24-27 Beginner camp for youth entering grade 3 only $226 First time campers get a sampling of JRVC. Campers enjoy traditional camp activities (crafts, aquatics, hikes, stories, games, vespers, campfires). July 24-30 Explorers camp for youth entering grades 5-6 $410 Experience the best of both mainsite and outpost activities: Campers spend Tuesday through Thursday nights in the Outpost setting, where activities include outdoor living skills including meal preparation.